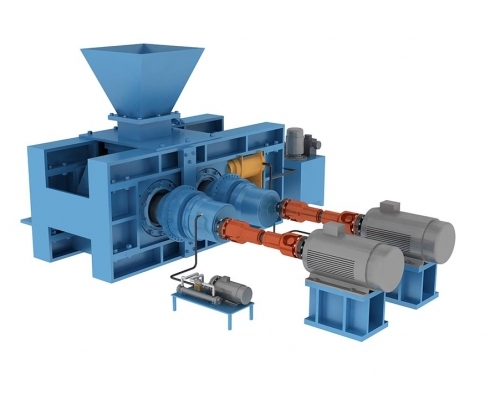 GM series mining high-pressure roller mill is a new product developed by our company on the basis of technology of a German company and developed by technology innovation. The device consists of two opposing rotating rolls. The material is fed from above the two rolls, and is pressed by the high pressure of the pressing roll to be pulverized between the materials to become a dense cake. It is mainly used for non-ferrous metal ore such as bauxite, iron ore, iron fine powder and finely divided cement raw materials, clinker, blast furnace slag, limestone and other materials. 1. Using a high-pressure roller mill in the process of the grinding system can increase the production efficiency of the entire system by 20% to 30%. At the same time, the total power consumption of the grinding system can be reduced by 25 to 50% compared with the conventional grinding method. 2. This product is equipped with a sealing roller cover, which can strictly control the diffusion of harmful dust and create an excellent production environment. 3. Compact structure, small footprint, high reliability, and an operating rate of approximately 95%. 4. This product is low in energy consumption and low in pollution. It is a series of products that respond to national energy conservation, emission reduction and low carbon environmental protection. The equipment is supplied as right-installed generally. Please specify in the contract if it needs to be assembled at left. The standard configuration does not include the electric control system. Please specify in the contract if electric control system is needed.